The victory of an established Senatorial aristocrat was one that seemed to reassert the authority and place of traditional political power, despite the means of Decius' ascension. The new emperor, no doubt aware of the perils of his position, seems to have embarked upon a highly conservative program of imperial propaganda to endear himself to the Roman aristocracy and to the troops who had thrust the purple upon him. One of his earliest acts was to take the honorific name of Trajan, whose status as the greatest of all emperors after Augustus was now becoming firmly established. 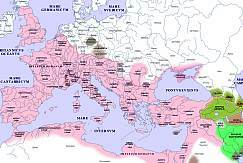 [] The fact that Trajan had commanded legions in Upper Germany and had close links to both Pannonia and Moesia at the time of his accession invited the comparison. The name was cleverly chosen: Trajan had been an active and successful general throughout his reign, but had also established a reputation for a widely popular civil government. On the other hand in late 249, when Decius returned to Rome, he embarked upon an active building program in the capital. After a destructive fire, he extensively restored the Colosseum. He later commissioned the opulent Decian Baths along the Aventine. He perhaps also was responsible for the construction of the Decian Portico. [] Such activities contrasted to a twenty-year period of relative building inactivity. Both the kind of building projects and their stylistic qualities suggest an attempt to recall the glories of the past. The numismatic evidence also suggests some degree of traditionalism. It is there that we see the first references to Trajan Decius, as well as an association with both Pannonia and Dacia. [] His Liberitas and Uberitas issues, combined with his wife's Pudicitia and his sons' Princeps Iuventi coins, all seem to rearticulate traditional ideology. [] Legends tend to be conservative, so this is hardly surprising, but there were no great innovations to suggest a new set of ideological principles. In sum, while the literary reconstructions of Decius' life are problematic, it seems clear that traditionalism was an important factor in his administration, especially in the wake of Philip's reign. Like other third century emperors, Decius was not free of threats to his authority, either from within or without. The revolt of Jotapianus, either in Syria or Cappadocia, had actually begun in Philip's reign, but was quickly quelled after Decius' accession. [] Probably the usurper's own soldiers murdered the would-be emperor, since the accounts state that his body was delivered to Decius while still in Rome in the summer of 249. Of greater concern than sporadic rebellions, which were relatively minor, were the vitreous northern borders. For the first time, a new and aggressive Germanic people, the Goths, crossed into and raided Roman territory in the 250's. At the time of Decius' forced accession, the Gepidae and the Carpi were both raiding deep into the Moesian provinces. They, along with the Goths, raided Pannonia and Dacia as well. Decius was forced to fight campaigns each year of his reign, doing his best to keep the borders stable. His final campaign in 251 led to the death of his son, Herennius, and to his own. Decius led a successful attack on the Carpi, pushing them out of Dacia. But Moesia Inferior had been left largely undefended and Cniva, king of the Goths, led a sizeable portion of his army into the province. [] The emperor, after chasing the Germanic force around the region, engaged Cniva's forces outside of Philippopolis, which had recently been sacked by the king and held by the rebel, Priscus. It was here that his elder son was slain by an arrow and the emperor, seeking to reassure his troops, famously proclaimed that the death of one soldier was not a great loss to the Republic. [] Cniva then led his troops homeward, laden with the spoils of war. The loss became Decius' undoing. Trebonianus Gallus, one of the emperor's commanders, may have revolted, although it is not entirely clear. [] Instead of regrouping his forces and re-securing the borders, Decius unwisely sought to chase down Cniva before he left Roman territory. His decision may have been motivated by his son's death (despite his insistence otherwise) or it may have been an attempt to salvage what had been a failed campaign. In either case, it was ill-advised. It was at Abrittus, about 100 kilometers northeast of Nicopolis that Decius finally met his death. [] Hoping to cut off Cniva's escape route (and perhaps minimize any help from Gallus), Decius' army was itself cut off in the marshy terrain. The details are sketchy, but Cniva divided his seventy thousand man army into three groups and surrounded the emperor's force. On July 1st, the emperor and most of his troops were slain. In the aftermath, the survivors named Trebonianus Gallus emperor, a decision subsequently confirmed by the Senate. Some contemporaries called the death tragic; others heroic. An Altar of Decius was erected where the emperor fell, still apparently famous two centuries later. [] Decius and Herennius may have even been deified. [] Christian polemicists, as might be expected, took pleasure in describing Decius' body being stripped and left on the battlefield to be devoured by animals. [] Whatever else, his was the first death of an emperor at the hands of an enemy of Rome. But even the account of his death, along with that of his son, must be looked on suspiciously. Their deaths bring to mind the sacrificial devotiones of the famous Republican Decii father and son, P. Decius Mus senior and junior. [] The circumstances of Decius' death, therefore, are perhaps as opaque as those of his accession. In spite of gaining some modicum of praise from both ancient and modern observers, Decius' reign was not well-suited to the demands of a rapidly changing empire. [] Conservatism may have been popular among a certain portion of the Roman elite, but the old aristocracy's power and influence all but disappeared in the third century. Decius clearly had a broader vision of what he wanted to accomplish in his reign than many of his contemporaries, and certainly he was vigorous, but he was also a man who was not sufficiently flexible when the moment called for it. His religious policy caused major disruptions in Rome and; in contrast to some of the other barracks emperors, Decius proved himself less than apt when dealing with Rome's Germanic foes. His death may have been heroic, but it was unnecessary and unsuccessful. This best sums up Decius Trajan's reign. Relatively little remains about Decius' reign. If there were a biography of Decius in the SHA, it no longer survives, although there are scattered references to his rule in the biographies of Claudius II Gothicus and Aurelian. Zosimus, i:21-23, Aurelius Victor, 29-30, Zonaras 12, Eutropius 9, Jordanes Get. 17-8, and Sylvius Polemius 37-40 have brief accounts of his reign. There are fragments in John of Antioch, fr. 148 and Dexippus, fr. 18. Eusebius, vi:39-41, vii:1, 11, 22, and viii:4, discusses his persecution, and there are passing references to his persecution in Socrates and Lactantius. Inscriptions and coinage are relatively abundant; see note 21 below for several epigraphic references. Alföldi, A. "The Crisis of the Empire," in The Cambridge Ancient History XII, 2nd ed., Cambridge (1939)165-231. Badian,E. "P.Decius P.f.Subulo" JRS 46 (1956) 91-96. Bennett, J., Trajan Optimus Princeps. A Life and Times, London and New York (1997). Bird, H.W., trans. Aurelius Victor: De Caesaribus, Liverpool (1994). Boteva, D. "On the Chronology of the Gothic Invasions under Philippus and Decius (AD 248-251)" Arch Bulg 5.2 (2001) 37-44. Clarke,G.W. "Double Trials in the Persecution of Decius" Historia 22 (1973) 650-663 . Floca, O. "Un monument sculptural de l'empereur Trajan Decius à Ulpia Trajana-Sarmizegetusa" Latomus 24 (1965) 353-358. Gibbon, E. The Decline and Fall of the Roman Empire, Modern Library Edition, New York. Hornblower, S., and Spawnforth, A. The Oxford Classical Dictionary, 3rd ed., Oxford (1996). Kelly, J.N.D. The Oxford Dictionary of Popes, Oxford (1986). Keresztes, P. "The Emperor Maximinus' Decree of 235 A.D. Between Septimius Severus and Decius" Latomus 28 (1969) 601-618. ________. "The Emperor Septimius Severus: A Precursor of Decius" Historia 19 (1970) 565-578. Kienast, D. Römische Kaisertabelle, Dartstadt (1991). Knipfling, J., "The Libelli of the Decian Persecution," Harvard Theological Review 16 (1923) 345-90. Mattingly, H. et al. Roman Imperial Coinage, Oxford (1923-81). Pohlsander, H.A. "Did Decius Kill the Philippi?" Historia 31 (1982) 214-222. _______. "The Religious Policy of Decius," Aufstieg und Niedergang der römischen Welt II 16.3 (1986) 1826-42. Rives, J.B. "The Decree of Decius and the Religion of Empire" JRS 89 (1999) 135-154. Robinson, Olivia F. "Repressionen gegen Christen in der Zeit vor Decius--noch immer ein Rechtsproblem" ZRG 112 (1995) 352-369. Salisbury,F.S./Mattingly,H. "The Reign of Trajan Decius" JRS 14 (1924) 1-23 . Der Kleine Pauly. Lexicon der Antike, 5 vols., Stuttgart (1964). Syme, R. Emperors and Biography: Studies in the Historia Augusta, Oxford (1971). Talbert, R., ed. Barrington Atlas of the Greek and Roman World, Princeton (2000). Wissowa, G., et al., eds. Paulys Realencyclopädie der classischen Altertumswissenschaft, Stuttgart (1893-1963). Wolfram, H. History of the Goths, trans. T. Dunlop, Berkeley (1988). [] In 251 at his death, Decius was purportedly fifty years of age; Syl. Pol. 40. Much of the surviving statuary and coinage shows a man of advanced age. []See most recently Kienast (1990):203-5. RE has a full recounting, which is not entirely trustworthy: xv:1251f. []The Herenni had been members of the Senatorial aristocracy, ennobled in 93 BCE; Cic. Brut. 166. The Etrusci branch were apparently of Italian origin; DKP vol. ii, 1060. []Zos. i:20:2. Cf. Zon. 12:19. []Marinus may have been trying to associate himself with Philip, judging from the few coins that survive; RIC4:3:104-5. []Although Zosimus implies that Decius already had some amount of military experience; i:21:3. []There are ample references to the Decii gens in the literary and epigraphic record. See RE, xv:1251-2, although the connection between Decius and the Republican gens is doubtful at best. []Aur. Vic. 29:1. Another tradition places his home in Budalia (Barrington21, B5), approximately 15 kilometers west of Sirmium; Eutr. 9:4. []See OCD3, 841-2. Since most of Decius' military operations were in Dacia, which had no known permanent garrison at the time, and Moesia, it stands to reason that he made use of troops in that province. [] HA Gordian 29-30; Zos. 1:18. []John An. (FHG iv) fr. 148, has suggested the latter, although Zos. i:21:2 and Zon. 12:19 suggest Verona. See Pohlsander (1986). []Zos, i:21:2, however, states that he was with his father. []For the importance of the rhetoric, Syme (1971):198-9. []The date of this decision was unclear, but since he is styled Traianus by 250 on coinage suggests it was early. On Trajan's growing popularity Bennett (1997). Already by the third century, the Senate wished each new emperor on accession: "May you be luckier than Augustus and better than Trajan;" Eut.. Brev. 8:5:3. [] S.H.A., Val. 5-7. Valerian was princeps senatus (president of the Senate) at the time; SHA Gord. 9:7. []He had awarded torques and armbands with his own hands, once giving a young Claudius II the honor; SHA Claud. 13:4. []CIL ii:4957, 4958, iii:3746, and 5988. []All but one of his surviving laws are either directly or indirectly tied to family issues: gift-giving, dowry issues, testamentary concerns; CJ iv:16:2, v:12:9, vi:30:4, vi:58:3pr. and 1, vii:32:3, and viii:53:3. Of interest, too, is the relatively short period in which the laws were issued: with one exception, all were issued in the second half of 250. []See Bird (1994) 128, n. 4, for building references. []RIC 28, 58b and 59b, 147c. Herennia Etruscilla's Abundantia issue with the figure of Pudicitia is a variation; RIC 74. [] It is perhaps noteworthy that Zosimus, an exaggerated proponent of traditional paganism and highly critical of Christianity, fails to mention this event. In fact, outside of Christian sources, we have no record of a comprehensive persecution. []He was also apparently one of the earliest, being executed in January of 250; Kelly (1986), 16-7. []See Pohlsander (1986) for a broad assessment. []Socrates notes that the origins of the Novatian movement came out of the persecution; Hist. Eccl. iv:28. It also indirectly encouraged the growing homooisian-homoousian controversy; v:19. []For Syria, Aur. Vict. 29. On Jotapianus' revolt, Zos. i:21:3 and 22:2. For the revolt in Cappadocia, see Zos. i:20:5 and Polemius Sylvius 37-8. []Aur. Vic. 29:5; Epit. 29:3. [] See Bird (1994)129-30, n. 7. The story is further confused by the claim that Valens had ruled in Illyricum; SHA TT 20. It seems likely that the author of the Thirty Tyrants either mistakenly or purposefully confused Julius Valens with Julius Priscus. [] Polemius Sylvius 39-40. On the possible help or advocacy of the Goths, see Jor. Get. 18; cf. Dexippus, fr. 18. []Aur. Vic. 29:4. Victor's narrative seems to imply that Priscus died before Decius, but if the Gothic king, Cniva, wanted to weaken Decius, it makes more sense that he moved against Priscus and Macedonia after beating the emperor. []Zos. i:24. Ammianus Marcellinus calls them Scythians, but this is a literary synonym; xxxi:5:15-17. []Jordanes states that Cniva divided his army in two and took one half into Roman territory for the raids; 18. []Aur. Vic. 29:5; Jordanes 18. Again, this statement may be literary artifice, given the nature of the sources. [] Eutropius 9:4. This is not repeated elsewhere and there is no archeological evidence to support Eutropius' statement, but is quite possible. []Lact. Mor. Pers.4, quoting Jer. 22:19 and 36:30. []Livy, viii:9 and x:28. See Bird (1994):130, n. 10. []Aur. Vic. 29:3, 30.2; SHA Aur. 42:6. Decius was also one of the few emperors in the third century crisis (along with Claudius II and Aurelian, to be deified; Eut., Brev. 9:4. Modern proponents have included Gibbon, v. 1, 206-18; Syme (1971), 199; and Alföldi (1939), 166-8. There is no direct evidence to corroborate this account. It may be a little too neat. The noted Roman historian, Sir Ronald Syme, has pointed out that Decius is the "palmary specimen of the reluctant usurper," a standard figure throughout the literature of the late Roman Empire. [] Numismatic evidence, however, does support the idea that Decius did not act precipitously. When Pacatianus began his revolt at the end of 248, the Roman mint at Viminacium ceased to mint coins for Philip and Pacatianus restruck Philip's coins with his own portrait. This revolt must have been suppressed in April of 249, as the mint there resumed striking coins for Philip at that time. Further, it is more than likely that Philip would not have sent Decius to pacify the legions without a substantial amount of money, perhaps even including good arrears of pay. The evidence from coin hoards shows that Decius neither struck his own coinage at this time nor re-struck Philip's coins. This would seem to indicate that, at least when he left Rome, he had not planned a revolt from the start, and for the first weeks after his arrival did not revolt against Philip. [] Then too, in a similar situation, he had remained loyal to Maximinus during the civil war of 238. In the Spring of 251 Decius and Gallus again determined to renew operations against Kniva, who was retreating back towards the Danube River. Once again, in the beginning, the campaign went well for the Romans. At some point in the fighting, however, Herennius, who, in the crisis had been elevated to the rank of Augustus, was killed. We are told that, when his soldiers tried to console him for the loss of his son, Decius, replied with words to the effect that: The loss of one soldier is but a small thing. [] Zosimus tells us that while these events were taking place Gallus had begun treasonable communications with the enemy. Accordingly, during the next engagement, after the Romans, had defeated two Gothic detachments and the Romans were in a swampy area near Abrittus (which is between the Black Sea and the Danube River), Gallus, acting according to a pre-arranged plan, gave a signal to the Goths who surrounded and annihilated the Roman force. Decius perished in the battle and his body was never recovered. He is the first, but not the last, Roman emperor to die fighting the barbarians. Gallus himself made a quick and disgraceful peace with the Goths and hurried back to Rome, where for a brief time he shared power with Hostilian, Decius' surviving son. [] Hostilian subsequently either died of the plague or was murdered, perhaps by Gallus. While engaged in the re-establishment of military order and the revitalization of the Empire's infrastructure, Decius also initiated a program that he hoped would effect a spiritual revitalization of the Empire as well. It was, however, this plan which set him on a collision course with the growing Christian population in the Roman Empire. One interesting point of the decree is there does not appear to be any one event which caused Decius to issue it. The third century was a time of great stress and troubles for the Roman Empire. While many of the disasters which befell the Empire lay in the near future, by 250 barbarian invasion, instability at the top and economic problems were all making their presence felt. In addition, Rome had just passed its 1,000-year anniversary and such a general thanksgiving would reaffirm the traditional pax deorum for the new millennium. In addition, it is important to recognize that the Roman state ultimately rested upon religious foundations and the tranquility and prosperity of the Empire depended upon a balance of human and divine forces. [] Therefore, as Decius sought to strengthen the Empire's physical ability to withstand invasion, he would not neglect the other equally important half of the equation, the spiritual side. Although the ancient non-Christian writers always spoke highly of Decius, his brief reign failed to give the Roman Empire the measure of stability it needed. It is of course impossible to say whether or not the disasters which befell the Empire could have been avoided or mitigated had Decius not been killed. Nor is it possible, given the present state of our sources to know what went wrong during his campaign against the Goths. Probably no one man could have met all the challenges of invasion, usurpation, plague, and fiscal collapse which confronted the Roman Empire during the coming decades. Certainly he attempted to rule well and establish the Empire's defenses on a firm basis. His legacy has, however, been largely determined by his attempt to establish a measure of religious conformity in the Empire and by the resulting persecution of the Christians. Cohen, Henry. Description historique des monnaies frappJes sous l'Empire romain. (Paris & London, 1880-1892). Magie, D. (ed.) Scriptores Historiae Augustae. Cambridge, MA. 1982. Mommsen, T. (ed.) Mounumenta Germania Historica 5.1 Jordanis Romana et Getica. (Berlin, 1892). ________.. (ed.) Monumenta Germania Historica 9.1 Chronica Minora. Chron. A.D. 354; Polemii Silvii. (Berlin, 1892). Oulton, J.E.L. The Ecclesiastical History of Eusebius. (Cambridge, MA. 1980). Paschoud, F. (ed.) Histoire Nouvelle [par] Zosime. (Paris, 1971). Rea, J.R. "Date Clauses of AD 250 and 251." The Oxyrhynchus Papyri LI (1984): 19-24. Rolfe, John C. (ed.) Ammianus Marcellinus. (Cambridge, MA. 1984). Wilcken, Ulrich. Grundzhge Und Chrestomathie Des Papyruskunde. (Berlin, 1912). Zonaras, Annales. ed. M. Pinder. Corpus Scriptorum Historiae Byzantium. Bonn, 1844. Clarke, G.W. "Some Observations on the Persecution of Decius." Antichthon 3 (1969) : 63-76. Eckhel, Joseph. Doctrina Numorum Veterum. (Vindobonae, 1828). Gerov, Boris. "Zur Identität des Imperators Decius mit dem Statthalter C. Messius Q. Decius Valerinus." Klio 39 (1961): 222-226. Gilliam, J.F. "Trebonianus Gallus and The Decii:L III et I cos." Studi in Onore Di Aristide Calderini E Roberto Paribeni. (Milan, 1956): 305-311. Gross, K., Liesering, E. "Decius." Reallexikon Fhr Antike Und Christentum. III (Stuttgart, 1957), 611-629. Hohl, Ernst. "Vopiscus und die Biographie des Kaisers Tacitus." Klio 11 (1911): 178- 229. Kerestes, P. "The Decian Libelli and Contemporary Literature." Latomus 34 (1975) :763-779. Knipfing, John. "The Libelli of the Decian Persecution." Harvard Theological Review 16 (1923) :345-390. Molthagen, Joachim. "Der römische Staat und die Christen im zweiten und dritten Jahrhundert." Hypomnemata 28 (G`ttingen, 1975). "Novatian and Novatianism." The Catholic Encyclopedia. (1913). Pohlsander, H.A. "The Religious Policy of Decius." Aufstieg Und Niedergang Der Romischen Welt. II 1b: 1826-1842. ________. "Did Decius Kill The Philippi?" Historia XXXI (1982): 213-222. Potter, D.S. Prophecy and History in the Crisis of the Roman Empire. (Oxford, 1990). Rives, J.B. "The Decree of Decius and the Religion of Empire." Journal of Roman Studies 89 (1999) : 135-154. Salisbury, F.S & Mattingly, H. "The Reign of Trajan Decius." Journal of Roman Studies 14 (1924): 1-23. Stein, Arthur. "Zur Chronologie der römischen Kaiser." Archiv fhr Papyrusforschung Vol 7. Berlin, 1924. Wittig, K."Decius." Paulys Real-Encyclopedie der classischen Altertumswissenschaft. Vol 5 (Stuttgart, 1932) cols 1244-84 (Messius No. 9). []Ernst Hohl, "Vopiscus und Die Biographie des Kaisers Tacitus," Klio XI (1911) p. 204, Combining the reports of Aur. Vict., Caes. 29.1, "Simiensium vico ortus"; Eutrop. IX.4, "E Pannonia Inferiore Budaliae Natus"; Epitome 29.1, "Pannonia Inferiore Bubaliae Natus". All of these sources are presumed to have used a lost history known as the Kaisergeschichte. Guido Barbieri, L'Albo Senatorio, No. 1662 Messius. []Wittig, RE, XV, col. 1250. []Ronald Syme, Emperors and Biography, (Oxford, 1971) pp 195-196. []For a summary of Decius' career before he became emperor, see op. cit. Wittig, RE, XV, cols. 1251-1252; op. cit. Kienast,. 204; op. cit. Barbieri, p. 295 No. 1662. []Syme, op. cit. pp 196-197; Also Wittig, RE, XV, 1251; Boris Gerov, "Zur Identität des Imperators Decius mit dem Statthalter C. Messius Q. Decius Valerinus," Klio 39 (1961) pp 222-226. []For sons, see Wittig, RE, XVcols. 1261-1267, 1284-1286; F.S. Salisbury and H. Mattingly, "The Reign of Trajan Decius," Journal of Roman Studies, XIV (1924) pp 12-16. Op. cit. Barbieri, No. 1595 & No. 1736. []Zosimus I. 20- 21; Zonaras 12.19 - 20. [] Syme, op. cit. p. 198. []Wittig RE, XV, 1252-1257, esp. 1257; Arthur Stein, "Zur Chronologie der römischen Kaiser," Archiv Fur Papyrusforschung, VII pp 40-42; also J.R. Rea, "Date-Clauses of A.D. 250 and 251," The Oxyrhynchus Papyri, LI (1984) p. 19 Nos. 3608-3610. []Op. cit. Rives, p. 142; and p. 142 note 46. "Like most of the other Balkan emperors, he was apparently devoted to Roman tradition. The most striking evidence for this is found in his own self-presentation. Shortly after becoming emperor he added the name 'Traianus' to his nomeniclature. Trajan was one of the great heroes of Rome, remembered not only as the optimus princeps but also as a great general and victor; hence the very name of the new emperor Trajan Decius promised the return of the good old days." Also Pohlsander (1986) p. 1831. For coins, Henry Cohen, Description Historique des Monnaies FrappNes Sous L'Empire Romain, (Paris & London, 1880-1892) p. 186, No. 2 et. al. []T. Mommsen, (ed.) Monumenta Germania Historica, 9.1, Chronica Minora, Chron. A.D. 354, p. 186; op. cit. Cohen p. 192, No. 71 et al.op. cit. Pohlsander (1986) p. 1835. []CIL III,2; CIL XI, 373. []Wittig, RE XV col. 1267. []Liebenam, op. cit. p. 30. []Wittig, RE, XV, 1269; Lactant. De Mort. Pers. IV.3; Zosimus I.23. []Wittig, Ibid; Vict. Caes. 29.1; Coins: Cohen V Decius, Nr. 37,38; 43-76; Herrenius, No. 6. []Syme, op. cit. p. 215; This is reported (at some length) in the SHA in the partial life of Valerian where the author says Decius appointed Valerian Censor, thereby reviving an office which had for many years been absorbed by the emperor. See Scriptores Historia Augusta, Loeb Edition (Cambridge, 1982) ed. David Magie volume III p. 8 note 3" The attempt to revive the censorship, as described here, is as fictitious as the 'Senatus consultum' itself..." It is better described by Zonaras XII.20 as some important position. []Wittig, RE XV 1270; CIL II 4949; CIL III 1176. []For a list of all the inscriptions relating to Decius' work on roads see Mattingly & Syndenham, pp 4-8. [] Wittig, RE XV, cols 1268-9; Eutrop. Brev. IX.4. Wittig rejects the idea that the VICTORIA GERMANIA legend on coins comes from the suppression of a revolt there, especially since the legends appears on Herennius' and Hostilian's coins also: "Das klingt [that it was for the suppression of the revolt] nicht nur unwahrscheinlich, sonder lasst auch ausser acht, dass je eine Mhnze des imp. Herennius... Aug und Hostilianus Caes. mit VICTORIA GERMANIA (Cohen, nr. 41 & 70) existiert." Also see an interesting comment in Joseph Eckhel, Doctrina Numorum Veterum, (Vindobonae, 1828) p. 345. []Michael Peachin, Roman Imperial Titulature and Chronology, p. 30., Peachin doubts if these titles were official. Although no papyri display them, there are coins with the reverse legend VICTORIA GERMANIA and DACIA FELIX. Nonetheless, Peachin remains unconvinced. []Wittig, RE XV, 1270-1273; op. cit. Potter, pp 44-45; Jordanes, 18. []Wittig, RE XV, 1271; Amm. XXXI 5.17; Vict. Caes. 29.3; T. Mommsen, (ed.) Monumenta Germania Historia, 9.1, Chronica Minora, Polemius Silvanus, p. 521. []Wittig, RE XV, 1272; Vict. Epit. 28. Also at this time the eastern provinces were experiencing serious problems as an adventurer named Mareades led a band of followers on expeditions which ravaged the area, even capturing cities. See op. Cit. Potter, pp 44-45. [] Jordanes, XVIII; Aur. Vict. 29.5. []J.F. Gilliam, "Trebonianus Gallus and the Decii: III ET I COS," Studi in Onore Di Aristide Calderini E Roberto Paribeni, (Milan, 1956), pp 305-311. []Ibid. 307; The idea that it was Valens was Mommsen's. []CIL IX, 4086; CIL XIV, 352; for the document from Dura-Europos, see J.F.Gilliam, Yale Classical Studies, 11 (1950) pp 76-77. []Ibid p. 310 note 25; CIL VI 32559; 32560. []Knipfing, p. 365 No. 4. Discussed in H.A. Pohlsander, "The Relgious Policy of Decius," Aufsteig und Neidergang Der Römischen Welt II 1 p. 1832-3; Joachim Molthagen, "Der römische Staat und die Christen im zweiten und dritten Jahrhundert," Hypomneta, 28 (1970) pp 80-82. []Knipfing, op. cit. p. 347. []Knipfing, p. 367, No. 6. []D.S. Potter, Prophecy and History in the Crisis of the Roman Empire, (Oxford, 1990), pp 42-43. []Pohlsander, op. cit. (1986) pp 1837-1838. []Ibid. 1838; Vogt, Reallexikon fhr Antike und Christentum II (1954) pp. 1185-1186. []G.W. Clarke, "Some Observations on the Persecutions of Decius," Antichthon, 3 (1969): 63-76. []Eusebius, VI, xli . 12-14. []Eusebius, VI. xliii-xlviiii; Catholic Encyclopedia, XI "Novatian," p. 139. []Clarke, op. cit. p. 63, note 1. []Ramsey MacMullen, Paganism in the Roman Empire, (New Haven, 1981) esp. pp 1-18. []Syme, op. cit. p. 193; op. cit. Cohen, pp V 190-193. Also in the Cambridge Ancient History Plates V (1939) 236-237. []Carson op. cit. p. 86. []Cohen, op. cit. pp 223-235. Copyright (C) 2002, Geoffrey Nathan and Robin McMahon. This file may be copied on the condition that the entire contents, including the header and this copyright notice, remain intact.